AccountEdge is going global. Acclivity on Monday released an international version of its accounting software for Mac-based small businesses that targets countries where there isn’t already a localized version of AccountEdge. U.S. small businesses have their own localized version of AccountEdge, and Acclivity brought the program back to Canada last year. In addition, Acclivity also develops versions for the UK (where the software is distributed by Mamut), as well as Australia and New Zealand (where it’s distributed by MYOB). The international version of AccountEdge essentially takes all the tax types from those other editions and mixes them together. That way, users can create whatever tax is required in their country. "While we don’t have the resources to build localized country- and language-specific versions of AccountEdge for every country in the world, we do know that the product customers are looking for is more or less what we offer, with minor tweaks," Acclivity managing partner Tom Nash wrote in a blog post on the new release. "So we’re building a version of AccountEdge that will work for small businesses just about everywhere." Besides configurable sales tax, the international version of AccountEdge features the multiple currency support you’d find in other versions. However, in this edition, users don’t need to lock in a currency; instead, they can select their home currency, while setting up as many additional currencies as they need. The AccountEdge interfaces comes in English, though users can customize invoices and other forms in other languages. 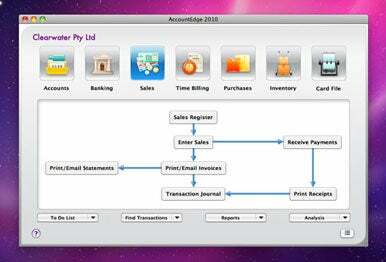 In addition, Acclivity also offers an international version of its AccountEdge Network Edition, which comes with three licenses and is optimized for use over a Mac OS X network. An Acclivity spokesman told me that the international version does not have the payroll command center found in the U.S. version, though the developer would consider partnering with local payroll providers. AccountEdge’s international edition costs $499. (In contrast, the U.S. version of the Mac program costs $299.) The three-license Network Edition sells for $899. The software is compatible with Mac OS X 10.5 and 10.6.